Congregational minister, Charles M. Sheldon is best known for his book, In His Steps (published in 1897), and for his efforts to obtain better educational opportunities for African Americans living in Tennessee Town (a former district of Topeka, Kansas). 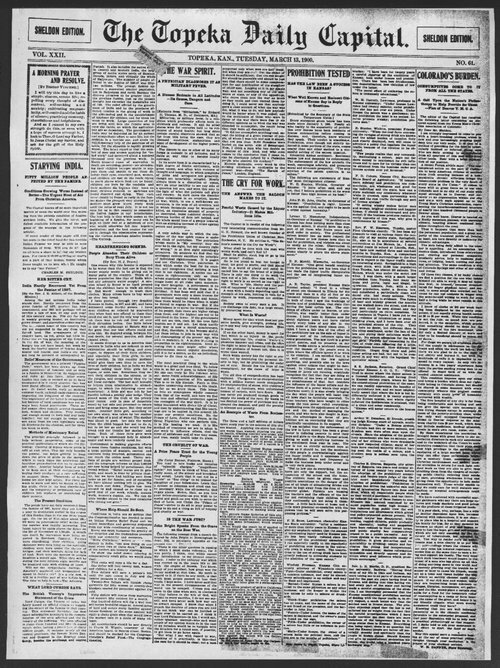 In March 1900, Frederick O. Popenoe, editor and owner of The Topeka Daily Capital, gave Sheldon complete control over the paper for a week. Sheldon tried to publish the paper as he thought Jesus would, refusing to print "hard" news or ads for tobacco, alcohol or patent medicines. Circulation rose from 15,000 daily copies to well over 350,000. He listed every person, including the janitor, in the editorial column except for Popenoe who had angered Sheldon by hiring an agent to advertise the special editions. All six issues of Sheldon's edition are included here. A searchable transcription is not yet available.